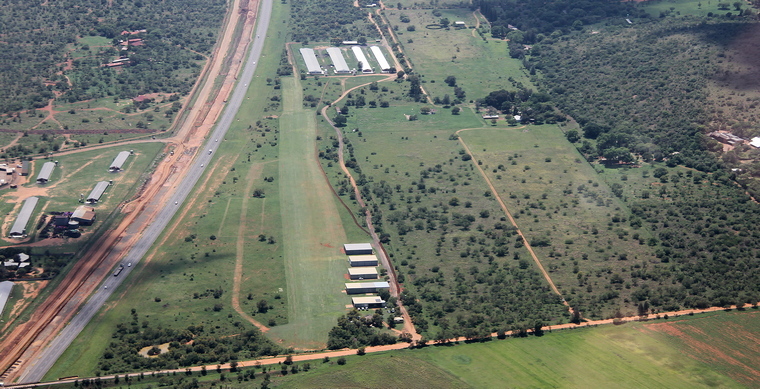 Kroon airfield, the friendly field adjacent to the Platinum Highway between Pretoria and Brits is the home of numerous weight shift and other aircraft as well as eight ICP Savannahs, surely a SA record for most of the type at a field. On Saturday 12 January the eight were joined by four visitors bringing the total to twelve which is without a doubt also a record for most of the type at a field in SA. Kroon Airfield has excellent facilities with secure and affordable hangarage equipped with state of the art alarm systems and cameras. The airfield that is the home of the Flying Club and Rosslyn MicroFlyers flight school has an 800 meter well maintained grass runway and beautiful thatch roof clubhouse with kitchen, braai, bar, shower and toilet facilities. Rosslyn MicroFlyers with an excellent safety record offers initial training, conversions, re-validation flight tests in all categories for the National Pilots License and hire and fly opportunities to our former students. Owner and Chief Flight Instructor Marius Nel together with 3 highly experienced instructors following the RAASA prescribed syllabus are ready to ensure our students get the best in ground School and Flight training at the most affordable rates. Marketed in SA by East London based Savannah Aircraft Africa (Pty) Ltd the ICP Savannah is a high wing, single engine, ultralight with side-by-side seating for two produced in Italy by ICP srl. Sold in both kit or as a ready to fly aircraft 2,500 have been sold worldwide of which 126 are flying in southern Africa. Structurally, the Savannah is a metal semi-monocoque. Most variants have a constant chord wing with flaps and ailerons combined into Junkers-style flaperons. The Savannah Advanced has a shorter, tapered wing. Early variants retained full span leading edge slats, later replaced with vortex generators. The high wing is braced to the lower fuselage with a V-pair of struts on each side. At their base, the spatted mainwheels of the tricycle undercarriage are mounted on cantilever legs. The Kroon based Savannah owners are all passionate aviators who love their aircraft. Theo Greyling started flying microlights in 2005 then moved on to Bantam. After experiencing the capabilities of the Savannah at Kroon Airfield he was hooked and decided to buy one and in 2015 became the proud owner of ZU-FIK, a Savannah VG XL. "What a difference it made in flying. It has more than enough power to get out of trouble and its short take off capability is a pleasure. Because it is all aluminium built maintenance is a pleasure compared to fabric. This plane can go places. We did Botswana and the Okavango Delta April 2018. With its high wing sightseeing is a pleasure." Theo said. 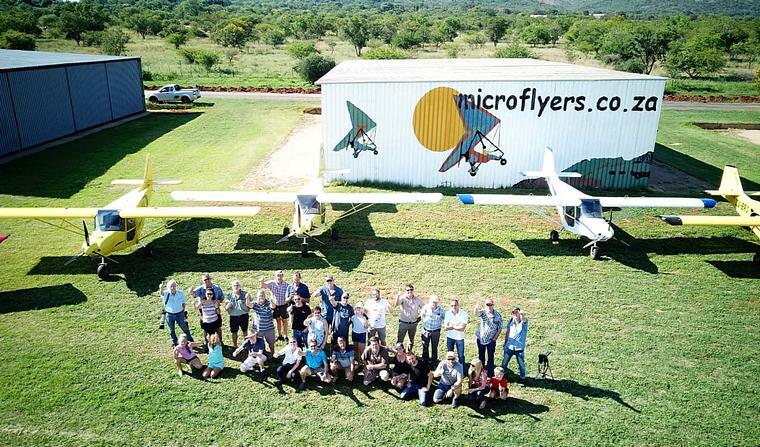 Deon van Heerden started flying trikes with Rosslyn Microfliers at Kroon Airfield in 2007. At the time it was a 'small boy dream' that had become a reality and he enjoyed every minute of it. In 2010 a friend of his emigrated to Australia and he had the opportunity to expand his flying skills by moving onto fixed wing flying when his wife bought him a Thunderbird MKIV for his fiftieth birthday. In 2014 his son and daughter decided to take up flying and they decided to upgrade to an 'all-metal' aeroplane. After some serious googling and research the decision was made to purchase the Savannah and the hunt was on for a plane. "The main reasons for deciding on the Savannah," Deon said, "was it's 'all-metal' construction and, due to us loving to fly and land on small and rough strips, the STOL capability of the plane. In May 2014 I got word of a Savannah VG for sale at Circus airfield and subsequently went to look at the plane. It did not take long for me to make the decision to make an offer which the seller agreed to. The following week ZU-WAR was moved to Kroon Airfield and training started in all earnest. Looking back on my choice of aeroplane I can agree with the accolades bestowed on it. It is really a great aeroplane to fly and having taken WAR to numerous remote areas, short and rough runways and even the beach will recommend to any aspiring hobby pilot in the light sport class." 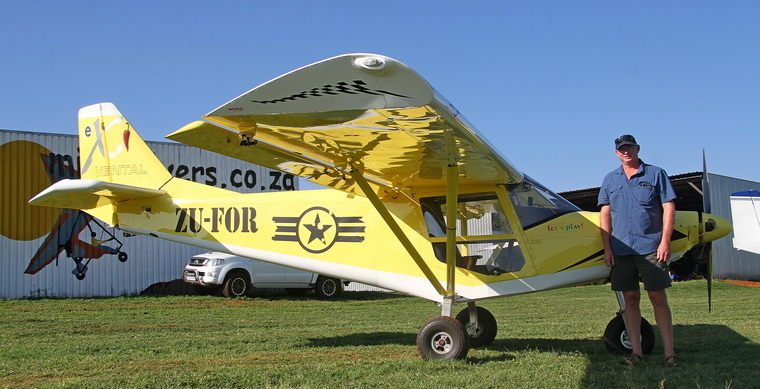 Jacques Kroon, the owner of ZU-FOR had his first flight in a Savannah with Dawie du Toit and he was hooked. He immediately started looking for one for himself. "I wanted a Savannah because of its STOL capabilities and wanted one with large wheels able to land and take-off from short rough strips. I'm tall and its cabin that had enough space for me and my language impressed me. The Savannah is a wonderful and forgiving aircraft to fly. I don't think I will ever fly anything else." Jacques said. Sarel van Der Walt & Gregg Brooks, the owners of ZU-ENP, originally flew weightshifts. "Being Trike pilots means that unless you are really into the whole shake-rattle and roll thing, you have limited times when you can fly because of turbulence and weather that can make trike life really uncomfortable. We fly for the joy of it and had a hankering to be able to do longer trips at a "faster" pace any time of the day, weather still permitting of course. Sarel wanted to be able to fly away and go and play golf for the day while my daughter Megan is busy with her CPL and needs to build some additional hours. Myself, I just want to have some fun. LSA was the way to go as operating costs fall into an "almost" realistic budget compared to certified aircraft - for normal folks like ourselves in any event. Taking into account the areas where we fly and the type of flying that we wished to do, the aircraft type was never really a major consideration as we had seen what the Savannah's could do. Sort of… "when I grow up I want one of those!" Then one fine day this awesome aircraft came up for sale at Kroon airfield. We looked at it with longing as we could not really afford it until someone came up with the idea of a partnership. At the end of the day Sarel and myself ended up in a partnership to a very nice Savannah VG". "It is an awesome aircraft. Rugged with a very decent STOL performance, you can land it literally anywhere without worries. While it is definitely not the fastest aircraft out there it gets the job done at an almost reasonable pace. The trip is part of the adventure right?" Gregg grinned. Jodie van Broekhuizen has been flying trikes since 2002. In 2015 he converted to LSA and bought his first Savannah, a VG. "I had endless, blessed flying hours and fun. Upgraded to Savannah S one year later - living, or should I say, flying the dream. For the love of flying - owning a Savannah is a no-brainer, being one of the most affordable, forgiving, safe, inexpensive, fun, versatile, rugged, easy to fly and (in my case) most colourful aircraft one can fly." Jodie told me at Kroon. Venusche is an aspirant pilot who is currently studying at Montana High School where has added Flight Academy as an additional subject to her curriculum. Johan Snyman, CEO and owner of J A Electrical Contractors based in Pretoria, always loved the idea of growing wings and with the newly acquired Savannah S aircraft he did just that. Constructed by Hans Schouten, Savannah S ZU-IHL 's flush pop rivet build literally and figuratively makes it the smoothest operated flying machine in the sky and on the eye at Kroon Airfield. Flying is one of Johan's favourite pass times which he refers to as going on "airplane mode" and just going offline from the daily rush. His reason for choosing the Savannah S aircraft? "Quality, versatility, affordability and easy control all in one." Danie van Heerden always wanted to learn to fly and own an aircraft. After retiring from a lifetime of service in the SA Army, he obtained his MPL and bought an Aquila 528 in which he accumulated over 100 hours. Although enjoying flying the trike, his dream was a fixed wing aircraft. "The trike had too many limitations to my liking. I have waited ages to start flying and I wanted to fly as much as possible. I started researching the options and looked at the Cheetah, Bushbaby and other similar aircraft - I wanted an all metal fixed wing with short field and off-airport capabilities. I spoke to Dawie du Toit and Jacques Kroon, both Savanah owners and both suggested that I consider the Savannah. I flew a few sorties with them and really liked the aircraft." "The Savannahs are quite popular and after a lot of phone calls and e-mails, I eventually sourced EHS in Swaziland and bought it. 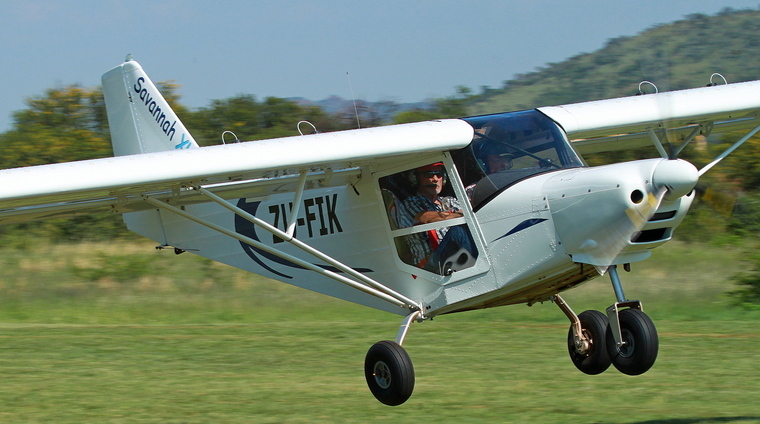 EHS was originally an Oribi (Savanah Airframe but with a Rotax 582 engine) It flew well in Swaziland, but during the ferry flight to Pretoria it became clear that I'll need a bigger engine. I managed to find a Rotax 912 ULS engine with low hours at a reasonable price and replace the 582. I also replaced a lot of the VG's , did a wing conversion to handle more weight, preplaced the drum brakes with disc brakes and installed electric trim. After the necessary tests and paper work I now owned a full blown Savannah VG." "I thoroughly enjoy my aircraft and fly every possible opportunity I get. To date I have accumulate almost 200 hours in EHS and intend to add a lot more hours to that." "About 5 Years ago," Dawie told us, "the first Savannah arrived at Kroon ZU-ENP. The then owners got training as they were previously trike pilots. I was not involved with their training. They however requested that I do their final flight test. I then got my conversion on the Savannah and conducted the flight test. At that time I had a Jabiru." "I was so hooked on the flying capabilities of the Savannah that I really want to get myself one. About 8 months later my friend and wingman Johan Welman phoned me to inform me that he got me a Savannah, which I then bought. Ever since I had only joy and fun with it. It is the most forgiving, stable and reliable aircraft in the LSA market. It is so addictive that we have 8 Savannah's at Kroon Airfield because of Johan Welman and myself. We have more pilots at Kroon that also want to own a Savannah when their time and money fall in place." 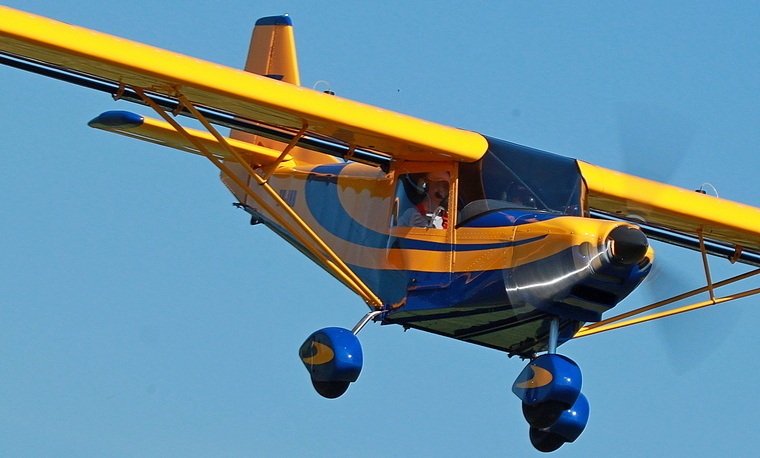 "This is a brilliant short field aircraft and handle rough and sandy terrain like a dream. It cruise at 95 to 105 m/h quite comfortably. Stall as low as 20m/h and can maintain straight and level flight at 35m/h. The newer and Savannah S is a bit quicker but isn't the flying the fun part? I am club chairman, a Grade A instructor and head LSA instructor at Kroon Airfield. Book a demo with me and I can assure you it will cost you dearly, not my fees but to get yourself a Savannah too." Dawie said smiling from ear to ear. Amongst the other visitors were……..
One will have to go far to find a more passionate group of owners than the Kroon group. Weekend warriors they aren't, they use their aircraft to explore the beauty of the country, regularly flying cross country to destinations few will dream off. All agree that they do it because in a Savannah they can. 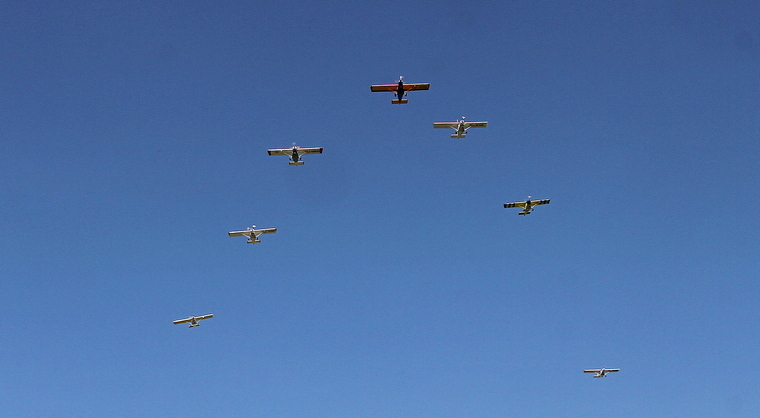 The annual Kroon Fly-in is normally held the first or second week in June and is an event not to be missed. Kroon also have an annual Fly away week to Margate during the March - April long weekends.